Today marks Pakistan’s 64th independence day. It’s a sad one, not just because of the ongoing floods, the worst natural disaster in our history, but because of how so many across the country are celebrating it. It is an important day for us, no doubt. But it was sad to see hordes of people burning money on fireworks, running amok in SUVs and firing automatic weapons into the air. Even those without access to these luxuries and banned items were still out on the streets, adding to the traffic jams and the general state of apathy. At any other time, such displays of joy and celebration are tolerable. It is a common perception that we don’t have many forms of entertainment and occasions such as these are opportunities to let off some steam. However, at a time when 20 million Pakistanis are homeless and in need of urgent help, there is no excuse. This sort of behavior is insensitive and shows that even if we have something better to do, we don’t. There were also campaigns that called on people to refrain from buying flags, fireworks etc. and instead, spend the money to help flood victims. Sad to see that they didn’t have much effect. Maybe we deserve to be ruled by the incompetent leaders that have mostly stood by and filled their own pockets. It was heartening to see the armed forces cancel the usual celebration plans for the 14th August and the 6th of September. And their efforts in this front are highly commendable. So are those of countless volunteers who have ventured into the worst affected areas and also those who have donated generously. But much more is needed. More money, more supplies and more volunteers. Things would look a lot more hopeful if we took part in the operations rather than be indifferent to the disaster. Interesting post! I’d also like to draw to your attention a recent UNICEF progress report and interview with a UNICEF Education Specialist on the situation in Pakistan after the floods. 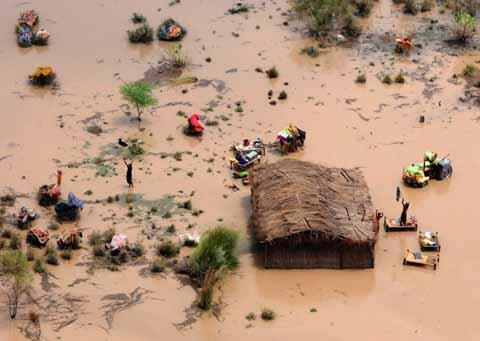 More than four months after the most devastating floods in Pakistan’s history, UNICEF warns that winter will worsen the threats against affected children who already suffer high rates of acute respiratory infections and malnutrition. For more information, please visit http://www.unicef.org/media/media_57141.html. UNICEF has released a new progress report on the children of Pakistan that highlights critical priorities including meeting the needs of those still displaced by the floods, shifting focus to returning populations, and being prepared for the upcoming winter months. For the full report, please visit http://www.unicef.org/media/files/Pakistan_100_days_Ver_1_9_Hi-res.pdf. Muqaddisa Mehreen, UNICEF Education Specialist in Pakistan, has also contributed an interview discussing the situation on the ground 100 days after the floods. To listen to the podcast, please visit http://www.educationandtransition.org/resources/interview-with-muqaddisa-mehreen-education-specialist-unicef-pakistan/. Would you kindly post the interview on your website or share with your networks as appropriate? Never lose hope in a better Pakistan. Lets believe and have faith in our country all the way. Let’s stand together and smile through each difficulty that flys our way. Let’s all be true Pakistanis!